I invented Walloped Potatoes because I ran out of hash brown potatoes. After some thought (I didn't want to go to the store again!) I discovered I did have two bags of waffle cut fries, and wondered if they would work in a scalloped potato recipe. Boy did they ever! So Walloped Potatoes were born. Waffled + Scalloped! You can, of course, cut your own waffle chips using a mandoline. Use the waffle blade and make the first cut. 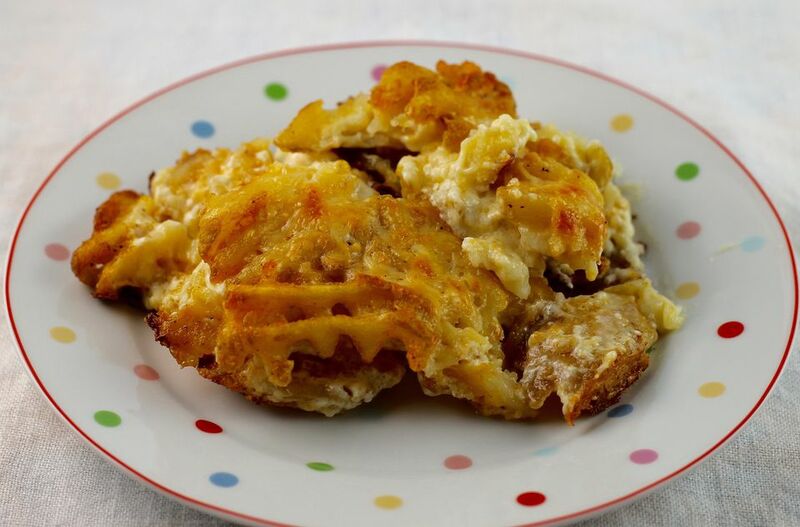 You'll then need to turn the potato one quarter turn and make another cut to produce the waffled, or criss-cross, effect. If you choose to use this method, the potatoes will need to bake for a longer period of time. Add another 20 to 30 minutes while the potatoes bake, covered. The potatoes are creamy in the middle, crisp on the bottom, and crunchy on top, with the best flavor. The cream makes the potatoes very moist, rich, and tender, and the cheese adds fabulous flavor. Best of all, this is a four ingredient recipe and it's easy to make! This will knock your socks off. You can use other types of cheese if you'd like, but you can't skip on the cream. Remember, this is a special occasion dish so some splurging is definitely in order. You could also add minced garlic or fresh herbs to the recipe. When you make a change, be sure to write it down so you can remember your masterpiece next holiday season! This wonderful dish is perfect for a holiday meal, especially Christmas since it's so warm and decadent. Serve it with a delicious glazed ham, some Baked Pineapple, and special green beans. For dessert, Christmas cookies, of course! Preheat oven to 375°F. Spray a 9" x 13" glass baking dish with nonstick cooking spray. Layer the potatoes in the dish, pulling each one in half so they are about the same size. As you work, add some layers of the shredded Havarti or Swiss cheese and sprinkle with the salt and pepper to taste. When all of the potatoes are in the dish, slowly pour the cream over all. Sprinkle with the Parmesan cheese. Cover the whole thing with heavy duty foil. Bake the casserole for 45 minutes, then remove the foil. Bake for another 30 to 40 minutes or until the casserole is bubbling and the potatoes are crisp and browned on top.